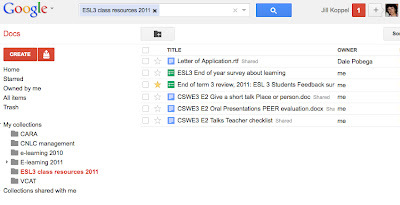 North-West e-learning mentor projects : Let's Google it! It seems that not only has 'Google' entered the English language as a verb describing the most ubiquitous web searching tool/ process on the planet, but its other components are becoming equally obligatory work tools. This year is the Year of Google Documents: not only can you share your docs in the cloud but you can invite others to collaborate, that is, to edit them anywhere anytime - even simultaneously whilst you're working on the very same one! Other must-have features include: a neat Revisions History that reveals each editor's edits in a different colour, text chat Comments in a sidebar so you can have a running commentary about content and immediate autosave (though I'm not sure if you can ever get access to previous versions...). Of course, as your collection of docs in the cloud grows, you'll need to Organise them - this entails adding them to - you guessed it - Collections (rather than folders). One of the biggest advantages is that you can link to the doc in other places - so whenever you update it, you don't have to send around a New Version of it to all your readers. Have a look at this cute little Tildee that I found when searching around for How-to instructions. 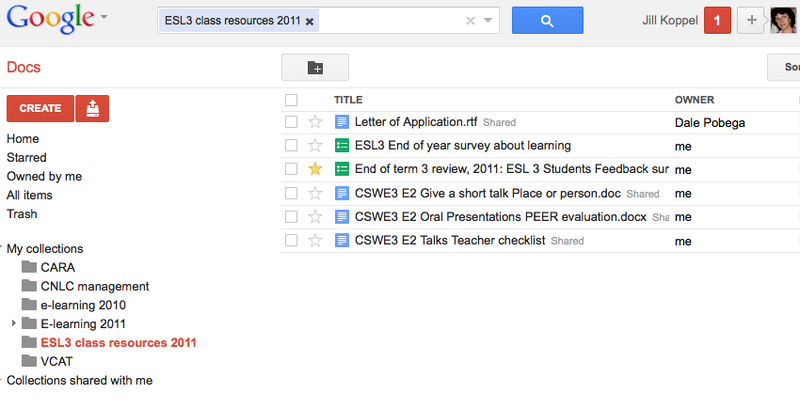 Do you think this would help people understand the basics of Google Docs? At CNLC we considered how we might immediately trial Google docs with staff to upload existing docs, such as the Computer room Problem Logbook so our IT consultant can access it from anywhere, or even the timetable (which undergoes repeated changes in the first few weeks of the year). Recently I was invited by our manager, Mary Parfrey, to spend an hour with members of our Committee of Management to get them registered with Google (you don't need a gmail account) so that they could edit, share and exchange comments when developing policy documents together. I am following Dale Pobega's (other) blog with great interest to see how he has gradually moved to Google docs for sharing worksheets (on his blog) with his students. Of course, he would have to make these public otherwise he would have to share them with each of the students individually. Maybe it's worth considering getting some Creative Commons copyright to cover this work. So what do you think: where would Google docs be immediately applicable in your daily work?